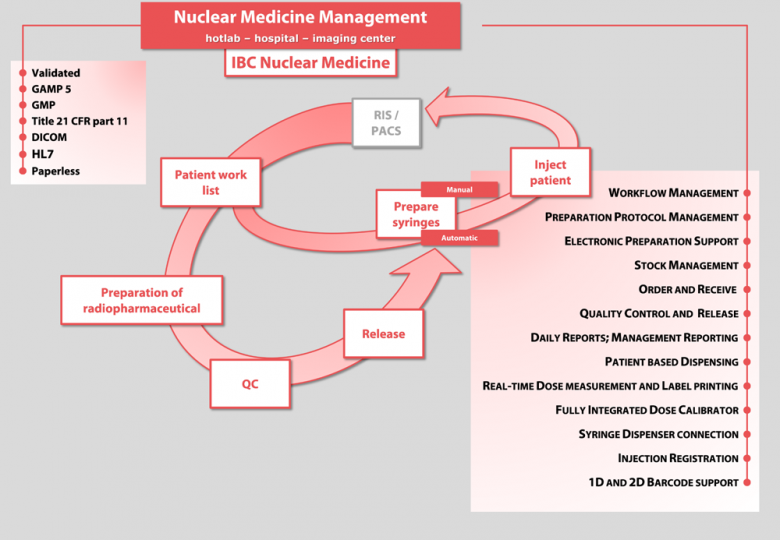 How to choose a solution to handle the daily workflow in a Nuclear Medicine Department or Cyclotron Facility. There are a variety of systems that are used to manage the daily workflow, but some are more suitable than others, depending on the problems you are facing and the environment in which you operate. To guide you in your selection, we have listed below three sets of problems you might be dealing with, along with the alternative solutions and the preferred solution. You are looking for a powerful and proven solution that fits your requirements and your limited budget. It has a seamless and wireless bidirectional connection with the COMECER IRIS injection system. You have to perform many errors-prone manual calculations, for example to calculate the activity at patient examination time and, in case you use decay tables, the determined radioactivity is not accurate. Due to regulation, you also have a manual register of radioactivity on stock and in waste. Moreover, you also need to handle a lot of paperwork to keep healthcare authorities satisfied during an on-site audit. Different systems make it difficult to create reports and combine data because they don’t communicate with one another or the communication process requires a huge effort. You need a system for inventory, waste, planning and order management, and you do not want to handle the administration manually. are forced by regulation, because you are going to ship your radiopharmaceuticals to hospitals and clinics in your area. 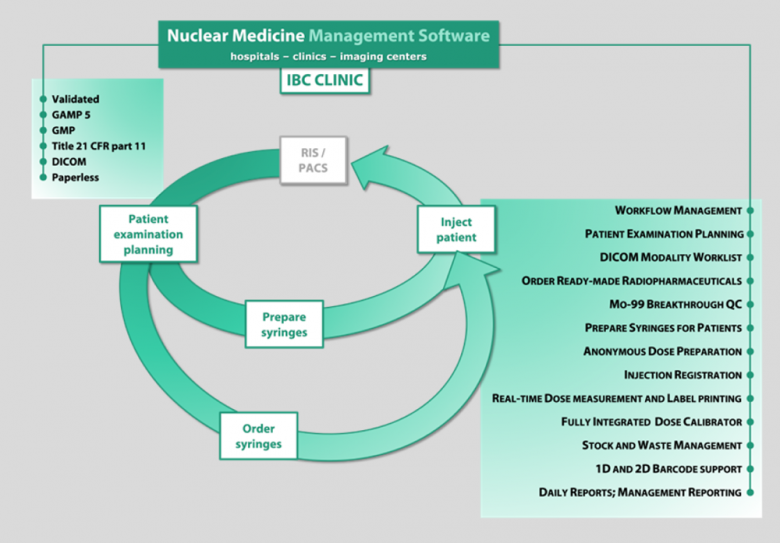 If you upgrade from IBC Nuclear Medicine, the functionality needed for your own nuclear medicine department for patient examination management, RIS/PACS link and injection registration remain at your disposal in the IBC GMP Radiopharmacy software. Different systems make it difficult to create reports and combine data because they do not communicate with one another or the communication process requires a huge effort. You want to get rid of extensive paper records – you even aim for a paperless working environment. It is suitable for customers shipping radiopharmaceuticals to clients. Due to GMP regulation, you are forced to register a lot of data that, with the alternatives, has to be entered multiple times in different systems or on paper. You have to perform many errors-prone manual calculations, for example to calculate the activity at patient examination time and, in case you use decay tables, the determined radioactivity is not accurate. All data related to your batch manufacturing gets printed in order to be able to combine it into a single batch record. You have problems in managing your backup because you have a giant paper archive. Moreover, you also need to handle a lot of paperwork to keep healthcare authorities satisfied during an on-site audit. You get lost in case of a recall or in case of time pressure during release of a batch. Standard operating procedures are printed and available in different rooms. Change management to these documents is a lot of work, as physical documents must be replaced (while a validated software system can present relevant documents at the right moment as well). 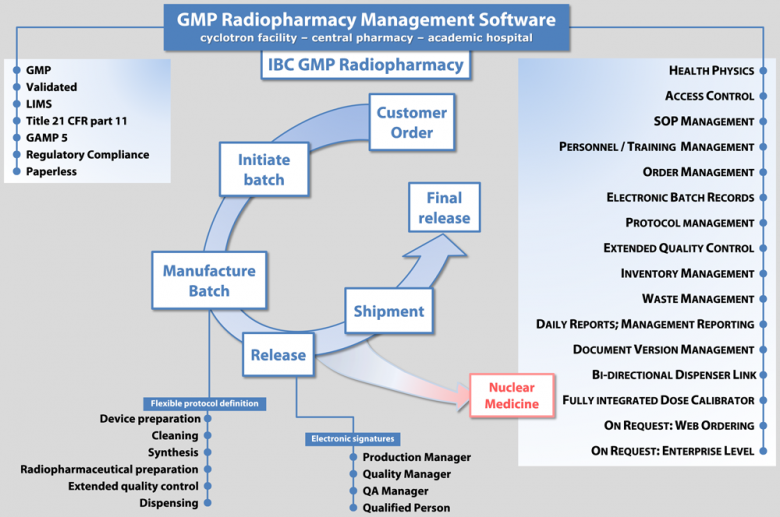 Different systems can help you to register the data you need to comply with the GMP directives, but they make it difficult to create reports and combine data because they do not communicate with one another or the communication process requires a huge effort.